as one of Library Journal's Best Books 2009. It is a hefty, sprawling work, more than 400 pages long, but at no point does it begin to sag under its own weight. Perhaps because its spread is solidly supported by facts, Mayo's intricate plot trips along at a natural, inexorable pace, easily traveling the sweeping map she has laid out for it, from Washington to Mexico City and all the way to the imperial halls of Europe... a swashbuckling, riotous good time, befitting the fairy-tale promise of the opening sentence. The Last Prince of the Mexican Empire packs a wallop. It is a fascinating historical account delivered in such sweeping, compelling prose as to ring more like literature than factand, fundamentally, one could say that its both; it proves false that old Dorothy Parker adage about historical novels being neither novels nor history. This is an extensively researched and brilliantly organized book, combining geopolitics, international finance, military strategy, and, alas, the eternal struggle of a family, a child, and the human heart in the midst of it all... Mayo, who has lived in Mexico for many years and has written extensively about its history and culture, is the author of a travel memoir about Baja California, among other works. Her literary style is seasoned, intelligent, and wonderfully informed. En México se han escrito novelas históricas que recrean con erudición, maestría y poesía una época, un episodio, una atmósfera y unos personajes. Pienso, desde luego, en Noticias del imperio de Fernando del Paso; también en la obra de Enrique Serna sobre Santa Anna, la de Rosa Beltrán sobre Guerrero o la reciente novela de C.M. Mayo: El último príncipe del Imperio Mexicano, sobre el nieto de Iturbide en la corte de Maximiliano. I have read a few sweeping historical novels that have remain inside of me forever. Tolstoy's War and Peace is one of those, Dickens's A Tale of Two Cities is another, Pasternak's Doctor Zhivago is another, and now The Last Prince of the Mexican Empire is another. The Last Prince of the Mexican Empire sheds incredible light on the day-to-day happenings in a royal court that was doomed, from the hour of coronation, to fail....Painstaking historical and cultural research is put to good use in Mayo's narrative, but the true texture of this novel is the rich and credible representations of the secondary characters. From the emperor's guards to the toddler's nurse, the supporting cast of perspectives provides a full insider's view of 19th-century life in Chapultepec Castle and Mexico City.... The Last Prince of the Mexican Empire is a stunning achievement, an inspired novel that steers clear of boring history lessons and instead zeroes in on the smallest epicenter Principe Agustin de Iturbide y Green to spiral out into a wondrous period, 1860s Mexico, a time of political possibility and unrest in which "persons who do not appear to share even a footprint's worth of common ground turn out to have destinies bound together in painful knots." El último príncipe del Imperio Mexicano no es una biografía... O para decirlo más acertadamente, es mucho más que una biografía. Se trata de una historia apasionada y original sobre ese experimento trágico, heroico, cruel, cómico y hasta absurdo que fue el breve gobierno de Maximiliano de Habsburgo en México. Para escribir la crónica de esa epopeya, la autora, C.M. Mayo, se involucró en un esfuerzo de investigación monumental. De no haber ocurrido de esa manera, el producto editorial habría resultado muy diferente y, por supuesto, de meor calidad... La perseverencia en este tipo de indagaciones resulta fundamental. Es la histamina que impulsa la exploración sin truega y que la autora nos comparte en esa suerte de confesión intelectual que es el epílogo de su conmovedor libro. Epic in scope, Mayo's impressively researched novel set in mid-19th century Mexico City mines the true story of the short turbulent reign of the archduke of Austria, Maximilian von Hapsburg, who was made emperor of Mexico in 1864. Childless and desperate for an heir, the emperor makes substantial monetary promises to the parents of a young boy named Agustin. With much trepidation, they agree to give over the boy, who becomes a pawn in a custody battle that begins when Maximilian adopts the two-year-old Agustin with the hopes of having him inherit the throne. Agustin's American mother, Madame de Iturbide (née Alice Green), soon becomes dissatisfied with the arrangement and pleads with Maximilian to return her son. Maximilian has Alice deported, which sets off an international brawl. Maximilian finally concedes as Mexico devolves into bankruptcy and lawlessness and Maximilian's wife, Carlota, becomes increasingly unmoored. Lengthy, expository, meandering and grandiose, Mayo's reanimation of a crucial period in Mexican history should satisfy history buffs and those in the mood for an engaging story brimming with majestic ambition. "a meticulously researched version of the infamous folly of Emperor Maximilian and Empress Carlota of Mexico, told in part from the remarkable, lesser-known perspective of Alice Green. ...The story is intriguing, with a cast of characters geerally left unnoticed by historical accounts. Yet Mayo found a plethora of primary source documentation once she started digging.... The story is not simply chronological, but includes frequent dranatic depictions of events laternated with supplying context, a technique that pricks interest and moves things along smoothly despite the complex baggage of historical facts.... This richly rendered telling lifts [the prince's] story from history's sidelines and fills it with life." This interesting yarn about Maximilians heir presumptive, Prince Agustín de Iturbide y Green, is set against the backdrop of the second Mexican Emperors ill-fated reign. Author C.M. Mayo winner of the Flannery OConnor Award for Short Fiction for her collection Sky Over El Nido has conducted significant research to compile a story that is both grand yet intimate about a child who sparked an international scandal. The intriguing tale of the Prince of Mexico offers a fine historical lesson about why Maximilians paternalistic adventure in a country that did not want him was doomed from the start. Mayo resurrects a sad story from the footnotes of history and embroiders the few details known about it into a rich historical novel... Mayo comfortably blends fiction with fact while illuminating a dark corner of North American history. Mayos cultural insights are first-rate, and the glittering, doomed regime comes to life in quick vignettes. Recommended to readers of popular history as well as historical fiction. Fans of such Mexican-themed novels as Laura Esquivels Like Water for Chocolate or Sandra Cisneros Caramelo might enjoy this for context and contrast. ... [A] rich historical novel... Political ambitions, the intrigues of the imperial court, and the relationship between countries at the height of European colonization all the drive the intricate plot of the novel, taking us on a dizzying journey from Washington to Veracruz to Paris and back to Mexico and the U.S.... The evocative descriptions and ironic commentary on the relationship between cultures make this an enjoyable and important novel, particularly relevant for these times. The search for an heir is the ostensible subject... The couple find a boy who had been born to a grandson of the previous emperor of Mexico, Augustín Iturbide, and they sign a contract with the parents saying that they will raise him, starting at age two... If this is all too confusing, don't sweat it: everything is made clear, charmingly so, in The Last Prince of the Mexican Empire. The book is chockablock full of royal families, royal rumors, royal disputes, as well as being an Upstairs, Downstairs to 19th Century royal life of uplands Mexico. C.M. Mayo's novel, The Last Prince of the Mexican Empire is the best sort of novel, the kind that allows you for the length of its story to live in another time, another world. With brilliant inmate detail and absolutely believable dialogue, Mayo gives us the inner lives of people caught in the paradoxical circumstances of royalty: enormous privilege and desperate conflicts. From the gentle love of a new mother for her princeling child, "O, how his lips made an O" -- to "Her Majesty" seizing the cup of chocolate from the hand of the pope and drinking it down, we are allowed to love and live, fear and fight for survival in a real world that Mayo has exhaustively researched. Mayo's craft in writing, personal experience of Mexico, and quality of wisdom make every character multi-dimensional in a complex yet understandable context. And in spite of teaching the reader a tremendous amount about Mexican history and life, this book is a very good read!! C.M. Mayo's The Last Prince of the Mexican Empire is a historical novel as well-written and researched as it is educational and entertaining. I knew little of Mexico's history before picking up this book, but Mayo has a gift for bringing historical figures to life in a brilliant combination of fiction and biography. Largehearted Boy's Book Notes column. C. M. Mayo cleverly and faithfully imagines the details behind the facts of this entangled saga. Her characters, based on years of research, are depicted as they might well have been. The authors fictionalization of Maximilian and Charlotte is thoroughly believable, drawing readers into the minds and hearts of the Emperor and Empress as they struggle to build a country and a legacy. Young Augustíns parents, Angel and Alicia, torn between love for their child and a desire to secure that childs future, are the opposing force to Maximilian and equally compelling in their determination to do whatever is best for their child and their country... The Last Prince of the Mexican Empire is a beautiful example of historical fiction done properly. Mayo has drawn from the scanty facts and filled in only what is necessary to lead the reader along a logical path of what-might-have-been. Not a quick read by any means, this is nevertheless a book to be savored for its artfully crafted prose and extraordinary characters. Mayo has taken a little-known incident in the history of Mexico and fleshed out the characters and the times in a broad, lush style. We may remember learning in school about the Emperor Maximilian and his wife Carlota, the (ultimately) mad Empress, who ruled Mexico for a short while after Frances misguided invasion. It all seemed a rather bizarre historical footnote; what we didnt know is that Maximilian and Carlota were given a young Mexican child whom they designated as their heir. The story of this child, Agustin, and how his parents allowed him to be taken away by the royal couple, is quite a remarkable story. Mayo, a longtime resident of Mexico, researched this story for years, in archives in North and South America. The Last Prince deserves attention. It is an ambitious book for tackling such a complicated little sliver of history, and Mayo brings her historic characters to life with a compelling story for a modern audience. I am enthralled with this book! The Last Prince of the Mexican Empire by C.M. Mayo is a historical novel of the best kind a tale based on history, not merely set in historic times about how Maximilian, the Hapsburg Emperor of Mexico, "adopted" the grandson of the first Mexican Emperor. There are so many characters telling the tale from their own point of view everyone from the Emperor to the scullery maid to the toddler prince himself and such a complicated plot! It has me hanging on every page. Lots of adventure and detail; great, clean writing that doesn't get in the way of the story. And all about a sliver of European / New World history that I kno nothing about and am intrigued by. This is the kind of novel to get lost in. Based on actual events, The Last Prince of the Mexican Empire tells the tale of two-year old Agustin de Iturbide y Green, a little boy of an American mother and Mexican Father who is adopted by Maximilian von Hapsburg during his brief time as the Emperor of Mexico. The little boy is made the Heir Presumptive, and his parents are expelled from Mexico and sent to France, which is the beginning of their quest to regain custody of their son. The cast of historical characters ranging from royalty to household servants is extensive, giving the reader a complete sense of understanding the time and circumstances of the actual participants of this intriguing real life drama. This short but tumultuous period of Mexicos history is fantastically told by first-time novelist, C.M. Mayo, fans of Mexican history will devour it. [T]his epic novel takes on a convoluted period in Mexico's history and the complicated families ruling or eager to rule in the mid-19th Century. Mayo does exceptionally well with multiple points of view, description, and character development to create a vivid dramatization. The Last Prince of the Mexican Empire would make a great book club selection and discussion. ...a very compelling story with a ton of juicy history to savor. Mayo has an elegant style that weaves in and out of fact and fiction as she reaches into the minds of the major players and then deviates to introduce supporting characters (nearly all of them real as well)... After finishing this wonderful novel I have new respect for the trials suffered by our southern neighbor in the recent past and also a deep desire to learn more about so many of the names involved, not the least of which the little boy who almost became the future ruler of a nation. The Last Prince of the Mexican Empire is impeccably researched and beautifully rendered. Those readers who love complex historical novels and who want to learn more about this time period in Mexican history will enjoy Mayos work. The political history of Mexico is as interesting as it is complex, but especially intriguing are the two brief periods when Mexico was ruled by an emperor.... C.M. Mayo's historical novel, The Last Prince of the Mexican Empire, provides a most engaging account of that second reign of 1864-1867... The intrigues, both personal and political, of the second regency are imaginatively related...Those who have read more than a little history of Mexico will realize the thorough historical historical research done by the author. ...a fascinating and engaging book. Mayo has done extensive research and this time period in Mexican history really comes alive through her writing. Sympathies change as different viewpoints are voiced and you come to realize the complexities of this political situation. The prose is luminous and the story is compelling. As a reader, I wanted to know what happened next and whether or not Alicia and Angelo got their son back. I enjoyed feeling like I was learning something; this is a period I know very little about and I always enjoy learning more. I appreciated in huge amounts the authors note with bibliography in the back of the book, particularly the bit about how she became interested, and I know I will now go off to read about Agustín and his family. This is a fascinating and complex novel about a little known period in Mexican history. The author's extensive research and richly detailed settings bring to life nineteenth century Mexico in a vast, colorful tapestry. From the lowly kitchen maid and the rough soldier to the bluest blood of the European aristocracy, we are treated to pieces of the story from every point of view....All in all, a very enjoyable book, a must read for the dedicated historical fiction fan. On your next trip, take this book with you. If you are traveling to Mexico, you will find new destinations that may pique your interest, such as the remains of Maximilians residences, which are described in this book. The Last Prince of the Mexican Empire is highly recommended as an entertaining read, with a strong Mexican heritage and a liberal interpretation of history. ...to understand the violence of modern Mexico, one must also understand the violence of 19th century Mexico. C.M. Mayos historical romance, The Last Prince of the Mexican Empire, brings to light aristocratic intrigue, revolutionary violence, and dynastic striving during the late 1860s... The political details are convoluted, but C.M. Mayo brings the story to life... she captures the atmosphere of Second Empire Mexico in the words, culture, language, and cuisine. We enter the minds of Emperor Maximilian, Empress Carlota, Princess Alicia, and many others, including cooks, diplomats, and revolutionaries. Obscure history has never been so interesting. In the Last Prince of the Mexican Empire, one will encounter a nation divided by dynastic splendor and revolutionary struggle, families sundered and ideals curdled by poor planning and political corruption. Theres even a little bit about pirates... The Last Prince of the Mexican Empire reads like a paleo-prequel to Bolaños 2666, a timely meditation on a violent, beautiful land and a people struggling for peace and happiness. 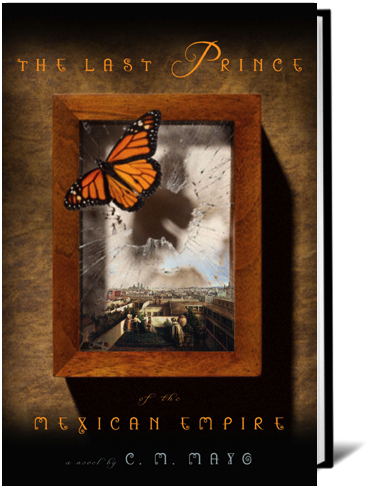 The Last Prince of the Mexican Empire is a sweeping historical novel of Mexico during the short, tragic, at times surreal, reign of Emperor Maximilian and his court. Even as the American Civil War raged north of the border, a clique of Mexican conservative exiles and clergy convinced Louis Napoleon to invade Mexico and install the Archduke of Austria, Maximilian von Habsburg, as Emperor. A year later, the childless Maximilian took custody of the two year old, half-American, Prince Agustin de Iturbide y Green, making the toddler the Heir Presumptive. Maximilian s reluctance to return the child to his distraught parents, even as his empire began to fall, and the Empress Carlota descended into madness, ignited an international scandal. This lush, grand read is based on the true story and illuminates both the cultural roots of Mexico and the political development of the Americas. But it is made all the more captivating by the depth of Mayo s writing and her understanding of the pressures and influences on these all too human players. Her prose makes the reader taste the foods, smell the spices and flowers and feel the heat of Mexico. Mayo writes for the senses. And for the ages. The Last Prince of the Mexican Empire is a story both sweeping and intimate, of geopolitics, the glamour of royalty, and the grit of military command, of the arrogance of power, the dark labyrinths of ambition, and, above all, of a child who was not, in the end, a prince, but a little boy who belonged to his parents. Given that Mexico remains much in the news, and that now is the time to better understand our neighbor, THE LAST PRINCE OF THE MEXICAN EMPIRE is as timely and important as it is engaging. Set during the mid-19th century, when Maximilian became Emperor of Mexico, Mayo's novel becomes a story of Mexico itself, its struggle for national identity amidst the wrangling for control of the Americas, its complexity, its rich history, its beauty, its culture. Maximilian and his consort, Carlota, arrived in Mexico City in 1864, propped up by the influx of French troops. Childless, in 1865, Maximilian took custody of with all appearances that this would be his Heir Presumptivethe two-year old Prince Agustín de Iturbide, grandson of Mexico's first emperor, a leader of Mexico's Independence from Spain, who had been executed before a firing squad. The boy's father, a Mexican diplomat, and mother, a Washington D.C. belle, immediately regretted their complicity. But Maximilian refused to relinquish the child, sparking an international scandal. This history is compelling and little known. Coupled with Mayo's evocative prose and vivid, compassionate characterizations, one cannot help but turn the pages to find out what happened, and why. C.M. Mayo has been living in and writing about Mexico for many years. Her books include the widely-lauded travel memoir, Miraculous Air: Journey of a Thousand Miles through Baja California, the Other Mexico, and Sky Over El Nido, which won the Flannery O'Connor Fiction Award for Short Fiction. An avid translator of contemporary Mexican literature, Mayo is founding editor of Tameme Chapbooks ~ Cuadernos, and has also edited the anthology Mexico: A Traveler's Literary Companion, a portrait of Mexico in the fiction and literary prose of 24 Mexican writers. She conducted extensive original research to write this novel, her debut. Mayo divides her time between Washington D.C. and Mexico City.